Last year I found a pair of sandals and espadrilles that I wore non-stop all spring and summer (see the review here). Unfortunately I wore the espadrilles to death and I didn’t buy a back up pair so I found myself in the same dilemna as last year searching for the perfect shoe to fulfill all my spring/summer footwear needs. This year my search began early in January when I came across Andre Assous who is supposedly the king of espadrilles. In hindsight I was probably overzealous because I ordered the Erika mid-heel espadrilles in both taupe and black because they were on sale (see my review here). As an update to my last review I didn’t like the shorter heel height but I sat on them for far too long so I couldn’t return them. Note: If you’re interested in Erika and you’re a size 7 please email me at what.jess.wore@gmail.com. I’m hoping to pass on both of these to other happy feet and I noticed they’re full price everywhere else. I wore out the taupe color once but the black pair is new and unworn. Color: When I unboxed Vee I wasn’t a huge fan of the silver metallic color. The color was misleading because it was supposed to be beige as indicated on the product details online. Comfort: I tried them on around the house and they seemed to be the same fit as last year’s version. However, I spoke too soon on Instagram and learned my lesson the hard way when I wore them out a full day and ended up with four blisters (two on each foot). The front cross strap design cut and pinched into the wrong places on my feet. For some strange reason my left pinky toe also kept falling out of the gap between the straps but this issue didn’t happen with my right foot. Note: If you’re interested in Vee and you’re a size 7 please email me at what.jess.wore@gmail.com. I’ve only worn them out once. Of course I was really disappointed that yet another pair of shoes didn’t work out so I searched online yet again when I came across the Andre Assous Josie espadrilles. Third time’s a charm because these are a winner in both comfort and style. Below is a laundry list of reasons why I like and would recommend Josie. Color: The taupe color is a neutral color that elongates the legs. It’s also a lighter shade of taupe the the color of the straps on Erika. 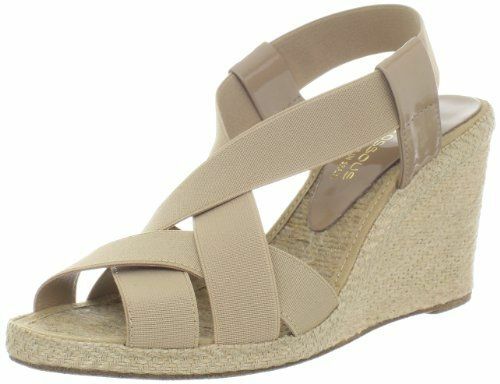 Heel height: The heel is 0.5″ higher than the Erika mid-heel espadrilles. Josie’s wedge heel measures 3.25″ while Erika was 2.75″. I personally prefer heels that are at least 3″. Comfort: The front straps are comfortable instead of binding. I didn’t end up with deep lines from the straps after wearing them for a full day. The back strap doesn’t dig in and it managers to keep your heel in place. Unlike my experience with Vee, my pinky toes did not fall through the side of the front straps where they cross over. Sizing: They run true to size. Sole: The sole is leather but managers to be non-slip which is a plus in my book. I appreciate not slipping and falling on my behind. Weight: Josie is light as air. Some espadrilles can be very heavy causing your heel to come out when you walk. Style: I really like the way this shoes hugs my feet and it’s just the right heel height to create a lengthening effect. If you have anypring and summer shoe recommendations please share. Great review Jess! Your legs look a mile long in these pics! I would recommend the J.Crew Mari sandals I just got. The leather is so soft and comfy. Thanks so much Annie! I'm looking forward to trying on your recommendation in stores! 🙂 I thought that they looked great on you and it's such a versatile color. Thank you Sheila! If you know anyone that is size 7 please send them my way. I just found your blog and am enjoying getting to know you. Thanks for blogging. I love the Ralph Lauren Cecilia wedge. They are not a sandal but are super comfy, well priced, versatile and come in many colors. I have bought one pair a year for the last several years. I like the heel height, the slip on convenience and the smaller peep toe which I find keeps my heel seated in the shoe better. Some of the stiffer fabrics need a little breaking but most do not. Check them out. I love love my Tom's strappy wedge. Super comfortable and cute. Thanks Diana. 🙂 I appreciate your recommendation. I remember seeing them but never tried them on. I will have to give them a try the next time I come across them. You're so lucky they come out with the same style every year. If the pair I like goes on sale I may need to buy a back up. Thanks Yi-chia. I learned some very expensive lessons the hard way. 🙁 I hope you find a pair you like because they are very versatile with spring and summer outfits. Thanks Samantha! I'm biased but these Josie espadrilles are my absolute favorite and I noticed that they are now on sale at Lord & Taylor for $89.99 (after 25% off the clearance price). It comes in taupe, navy and black. I get a lot of inquiries about them. 🙂 I've worn them all summer and they're really comfortable so I plan to get other colors as well as as a back up in taupe.